Buffs away quick detail sprays and spray waxes with ease. The Supreme 530 Microfiber Towel pampers your vehicle with an ultra soft and thick microfiber blend. The unique blend of 75% polyester and 25% polyamide gives the towel a balance of softness and toughness to perform any detailing task. Buff paint, dust the interior, clean glass, and dry your vehicle. The Supreme 530 Microfiber Towel is composed of millions of manmade fibers, each 100 times smaller than a human hair! More than 250,000 of these micro fine fibers per square inch compose this incredibly soft, plush fabric. The split weave construction makes the Supreme 530 Microfiber Towel strong and absorbent. The superior absorbency and plush weave make the Supreme 530 Microfiber Towel great for quick detailing and waterless washing. 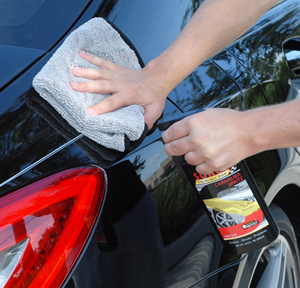 The microfibers grab dust and light dirt to safely remove it from the paint. The Supreme 530 Microfiber Towel is lint-free. It has a microfiber border and a removable adhesive tag. Remove tag before using or washing the towel.